Weekends: Peak hours all day. Photo, video and audition rates upon request. Audition: varies depending on amount of people. Minimum rate $35 per hour. PAYMENTS: We take cash, check,Venmo (@hyperionartsLA) PayPal (hyperionarts@aol.com), or Zelle (for zelle payment: reference phone number 818-383-2650). No Credit card please. Sundays 6-7 PM, and on certain Sundays after 7 PM (please inquire). *Occasionally late afternoon available--please inquire. Note: Sunday evenings after 7 PM not available until June 2019. Auditions: varies depending on amount of people. Minimum rate $36 per hour. Theater rentals consists of both dance studios converted into a performance and/or art space. Theatre is generally only available Saturday evenings. Please ask about other arrangements should you want to get into the space earlier. $390 for an evening (4:00PM to 11:00PM). Entire premise, both studios. • A crew to set up strike the theatre (lower drapes, set up risers and chairs. We will be there to guide you with the set-up & strike process. • A lighting and sound person (if needed). • Ticket seller, house manager, etc. • You must bag and remove all trash from the premises before you leave. • Space is expected to be left as it was found. Payment: please pay half ($180) to reserve the space and the other half on or before the night of performance. Theater Cancellation : A full refund of the deposit is given if cancellation is presented a minimum of one month before reserved performance date. • Theatre lighting system with programmable Leprechaun light box with various capabilities (timed dimming and strobe), with 6 separate lighting schemes on the box: grid lights, center spot, stage right/ stage left high intensity fresnels, and downstage/ upstage ambient lights. • Floor to ceiling black duvetyne drapes with 3 wings. • Seating on risers for ~60 people. • Sound system to play CDs or mp3/aux jack. • Lounge/reception/refreshment area (20 X 20) that can double as an art gallery. • Tropical garden breezeway along the side of the entire complex (Approx. 10 X 60) with a wood deck and fairy lights through garden. • Heat, but no air conditioning (fans only). 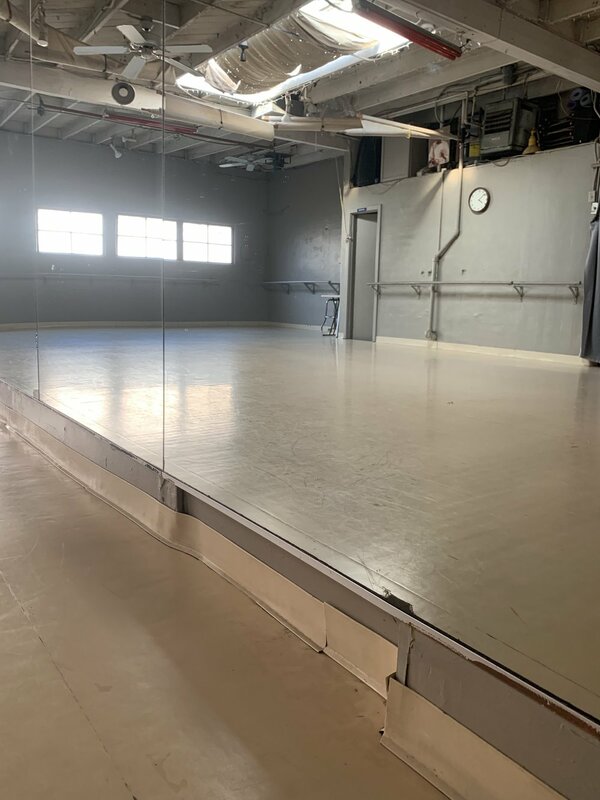 In order to fully secure the space, payment in full must be received by Studio A dance one week prior to requested time(s). Cancellations for rentals less than 2 hour-slots must give 48 hour notice or more notice for a full refund. Last minute cancellations (less than 48 hours notice) or no shows must forfeit a re-booking fee of $40. Cancellations for a block of time of more than 2 hours must give 2 weeks or more notice for a full refund. Less than 2 weeks notice must forfeit a booking fee of $75. Renters may need to supply their own music equipment (please inquire). For groups larger than 10, renter is responsible for removing trash brought in. No Flamenco or hard heeled shoes allowed.